There are two species in the genus Chinchilla, and the Long-tailed chinchilla (Chinchilla lanigera) is one of them. This is the species from which the domesticated chinchillas in the pet trade are believed to hail. In English, the Long-tailed chinchilla also known as Common chinchilla, Lesser chinchilla, Coastal chinchilla, and Chilean chinchilla. In the past, Chinchilla lanigera has been assigned to several other genera, and older sources can therefore be using names such as Lommus lanigera, Cricetus lanigera, Mus laniger, or Cricetus chinchilla for this species. The name Chinchilla velligera is also a synonym. The word lanigera means “bearing a woolen coat”, although the coat of the chinchilla is actually not woolen. Compared to its close relative the Short-tailed chinchilla, the Long-tailed chinchilla has longer and more rounded ears and a longer tail. Also, the neck and shoulders are not as thick as that of the Short-tailed chinchilla. The long-tailed chinchilla is also smaller, growing to be about 10 inches / 25 cm long in the wild. The ears of the Long-tailed chinchilla can be up to 4.5 cm long, and the tail is usually roughly one-third the size of the body, sometimes even longer. Reports of tails exceeding 5 inches / 12+ cm exist. Another notable difference between the two species is that C. lanigera has 23 caudal vertebrae while C. chinchilla only has 20. An adult male C. lanigera typically weighs 13-17.5 ounces (circa 375-500 grams) in the wild, while females tend to stay around 13-16 ounces (circa 375-450 grams). Domesticated chinchillas are usually heavier than this, and it is also common for females to be heavier than males in captivity. The hairs are 2-4 cm long and 5-11 mm in diameter. Up to 75 hairs can be growing out of a single follicle, making the coat extremely dense. The hair features gray, white and black bands. It is extremely soft and gives the coat a silky feel. The chinchilla has an abundance of whiskers (vibrissae). The are long and strong, reaching a length of 10-13 cm. Three different varieties of C. lanigera is commonly recognized. This variant has a heavy bone structure and tends to be quite muscular, especially compared to Costina. La Plata looks more compact, and its short, wide head gives it a roundish appearance. The shoulders are often as wide as the chest and rump, further adding to the animal’s roundishness. The short, almost round, ears are set far apart. The dorsal line is comparatively straight. When it comes to general body structure, Raton is pretty similar to La Plata, but noticably smaller. The nose is pointy, more like the nose of a Costina than a La Plata. The ears are located close to each other. The bone structure of the Costina is much weaker than that of a La Plata or Raton, and the musculature is less pronounced. The shoulders are narrower, and the hind legs are significantly longer. The front legs are fairly short and placed close together. The vertebral column is more arched than that of La Plata and Raton. In some individuals, the neck line is so deep that a slight hump appears on the back. The nose is pointy, similar to a Raton. The long ears are set wide apart, more like a La Plata than a Raton. If you look at the head from the front, it looks V-shaped. The natural range of the Long-tailed chinchilla is found in the Andes Mountains in western South America. Today, it is only known to exist in Chile, but it might have had a larger range in the past, before the extensive fur trade. As you can see, the range for the Long-tailed chinchilla, at this point, was within the borders of Chile, but reaching very near the Argentinian border. It is also clear that the Long-tailed chinchilla lived to the south of the Short-tailed chinchilla, although from Huasco to north of Chanaral there is a certain overlap (although the two populations are still separated, with the Long-tails living west of the Short-tails). We do not know much about what the ranges for the two chinchilla species looked like before the extensive fur hunting that commenced in the 1820s. Even though the practice of hunting chinchillas for their fur is very old (pre-Columbian), it wasn’t until the 1820s that it got really huge. Aucó, near Illapel, in Chile. (Coordinates: 31°38’S, 71°06’W). This is where you’ll find the nature reserve “Reserva Nacional Las Chinchillas”. Talca, in the Talca Province, Chile, and going northwards and eastwards. Both chinchilla species are listed as Endangered by the IUCN. In 2008, Chinchilla lanigera was listed as Critically Endangered, but this classification was changed to just Endangered in 2016 since the species had recovered somewhat in certain areas. Wild Chinchilla lanigera breed between October and December. This is spring time in the Southern Hemisphere. Two offspring per litter is the norm. The gestation period is 111 days. 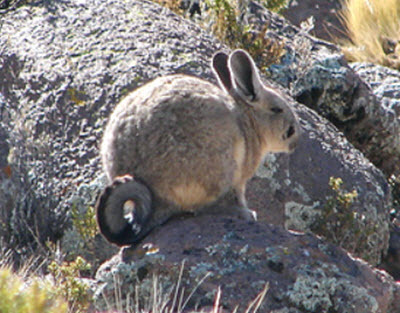 One of the places in Chile where wild Long-tails still live is the nature reserve “Las Chinchillas National Reserve” in the Choapa Province, within the Coquimbo Region. The reserve is 42.29 square kilometers in size, and it borders to private and communally owned lands that also inhabit Long-tailed chinchillas. In addition to protecting the chinchillas, the reserve also provides a home to many other species, including a lot of native rodents. Two fox species have been reported from the reserve, and wild felines – including pumas – have been seen within the reserve and at the surrounding hills. Many birds species live here, including Harris’s hawk, the Moustached turca, the Chilean tinamou, and the Chilean mockingbird. Sometimes, Andean condors are spotted. Three different owl species has been reported from within the reserve: Great horned owl, Austral pygmy-owl, and Burrowing owl.